Will Wells Fargo Raise Its Dividend in 2017? With its reputation under siege, will the bank at least give shareholders what they want? Wells Fargo (NYSE:WFC) did an exceptionally good job of making it through the financial crisis in 2008 with minimal damage, weathering the turbulence in its stock price and rising to all-time record highs in the early and mid-2010s. Along the way, Wells Fargo also sought to regain its standing as a strong dividend stock, and it has successfully restored its quarterly payout to levels above what it had paid prior to the crisis. Yet recently, the bank has run into controversy with a scandal involving employees opening fake accounts, and Wells Fargo's most recent earnings weren't as strong as the company has seen in the past. Some investors are wondering whether the bank's track record of dividend increases since the financial crisis could be in jeopardy. Let's look more closely to whether Wells Fargo will raise its dividend in 2017. For most of its history, Wells Fargo was a solid dividend growth stock. The company made regular increases to its quarterly payout in the 1990s and 2000s, making measured boosts during most of that time. Several stock splits in the 1990s reflected the growth of the banking giant, and the amount by which Wells Fargo increased its dividend was regularly 10% or more. That trend continued through late 2008, with the bank's final dividend increase before the financial crisis hit coming in August, just a month before the events that led to the near-collapse of the banking system. After that, Wells Fargo slashed its dividend by 85% in 2009. In doing so, the bank followed the same game plan that most of its peers used in light of Federal Reserve oversight and regulatory capital constraints. 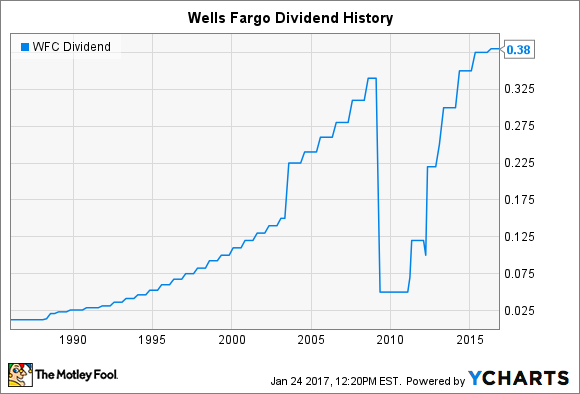 Yet even the crisis didn't hold Wells Fargo down for long, and by 2011, the bank had started boosting its dividend once again. After the crisis, Wells Fargo became a dividend growth machine. In 2014, the dividend surpassed the former peak level from before the financial crisis. It marked the culmination of a trend that had led to a sevenfold increase in the quarterly payout in just three years. Yet more recently, the bank had started to see its dividend growth pace slow. An increase of 7% in 2015 wasn't all that bad, but it was still less than its typical double-digit percentage pace. Then last year, Wells Fargo only gave investors an extra $0.005 per share, amounting to just 1.3%. Now, Wells Fargo has seen its earnings move lower. Unlike many other big banks, Wells Fargo doesn't have a large trading operation, so it's more dependent on better conditions for its core banking segment. At the same time, Wells Fargo had positioned itself to weather low rates for a longer period of time. It therefore didn't benefit as much from rising interest rates that the economy saw during the final month of 2016, and hedged positions in the interest rate and currency arenas cost the bank nearly $600 million. The big problem is that customer confidence in Wells Fargo has taken a big hit from its scandal. Former CEO John Stumpf left the company, and employees have been given different directives with respect to the bank's sales practices and how bankers get paid. As a result, new account openings have fallen sharply. That too has caused a downward impact on earnings. Wells Fargo will want to demonstrate that it can make it through tough times, and raising its dividend would be a sign of strength, even during its current struggle. Yet the company has already shown its willingness to do token dividend increases, and so investors should expect a small $0.005 to $0.01 per share increase in 2017 that will have little impact on its yield. As important as Wells Fargo dividends have been for shareholders, the more important question is how the bank recovers from the damage that it has done to its reputation. Without customers regaining confidence, Wells Fargo shareholders won't be able to count on sustained dividend growth in the future.